Today I would like to present a wiring diagram with modification for Schecter C-1 and Solo electric guitars. The mod is based on a toggle switch, which is in the place of one of volume pots. The switch will allow you to get a new, extra tone - more crisp and with better dynamic. It's based on Charvel's one pot wiring. The modification is quite economical. To make it, you need only one mini toggle switch - DPDT on-on type. The rest of parts can be from the stock wiring. As you can see, the extra switch (blue) is in the place, where the standard wiring has got a volume pot. This pot is the cost of my modification. My wiring has only one volume potentiometer for both pickups. 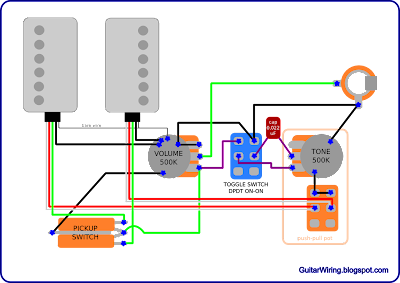 The pickup switch (selector) and the tone control pot will work basically like in the original wiring. There is also the same way of coil splitting. Pickups wires colors are based on the Seymour Duncan's way of coding. The extra switch will work basically as a tone switch. By using it, you can switch on and off the tone control circuit – the tone potentiometer with capacitor. It will change the tone even if the tone knob will be on „10”. The tone potentiometer has got its own resistance (500K), which is acting on your guitar signal, if the tone circuit is connected. By disconnecting it completely, more treble signal will pass to the output. The tone will be more crisp, with more treble and better dynamic. This mod can be made also with a push-pull pot, but I think, that a toggle is much more comfortable in use for this purpose. This wiring can be especially good, for those of you, who are looking for more treble and dynamic from Schecter C-1 or Solo guitars. The modification is based on a switch, so you will always have a possibility to get modded tone, or switch back to the original character of the guitar.